Proposed Area A (see the map below) will be the heart of the future Seymour Landing community. In 2014, together with a number of experienced architects, land use planners Jorden Cook Associates, engineers at Webster Engineering Ltd., and key stakeholders, the applicants reconfigured the concept for the Inn/Resort, office, restaurant, pub and assembly spaces that was originally contemplated for this site. A key design consideration was a decision to expand the marine-oriented part of the site to add a portion of Block 1 (D.L. 1412, Plan 6372), the 0.75-hectare (1.85-acre) waterfront parcel between the Inn/Resort and Seymour Bay Beach, which was not available at the time of the original zoning in 2002. This will add to the flexibility and functionality of any waterfront and passenger ferry uses being contemplated for this site. Public road access via Beach Drive is provided on the south edge of the site, and a fire lane/service lane will provide a link between Beach Drive to the south and Area A to the north. A large parking area is also provided on the south edge which will serve the Inn/Resort, the golf course, and visitors. The parking and road area are within the shadow of significant tree cover immediately south of the site. Placing these uses here opens up a sunnier part of the site to people-oriented uses including the cottage concept for the Inn/Resort, outdoor gathering areas, seminar space, restaurant/pub deck, and administrative spaces. “INN” means a building or group of buildings that may contain sleeping accommodation, with or without limited kitchen facilities and bathrooms, and spaces for social gatherings, meetings, dining, kitchen facilities, recreation facilities, spa facilities, administration and supporting services and staff housing. “LIMITED KITCHEN FACILITIES” means an area within the guest rooms of sleeping accommodation that is equipped or capable of being equipped with a stove, fridge, and sink suitable for the preparation and cooking of food for temporary occupancy of guests. It is also proposed that a Floor Space Ratio (FSR) of 0.3, and a maximum lot coverage of 40% be allowed for Area A to allow the development of the Inn/Resort to a size needed to achieve financial viability. It is proposed that the FSR and current floor area restrictions for permitted uses (i.e., a total of 6,140 square metres or approximately 66,000 square feet for the Inn and other permitted uses) are sufficient restriction on the size of uses and buildings, and therefore it is proposed that the current restrictions on the floor area and number of guest bedrooms for the Inn in Area A be deleted. 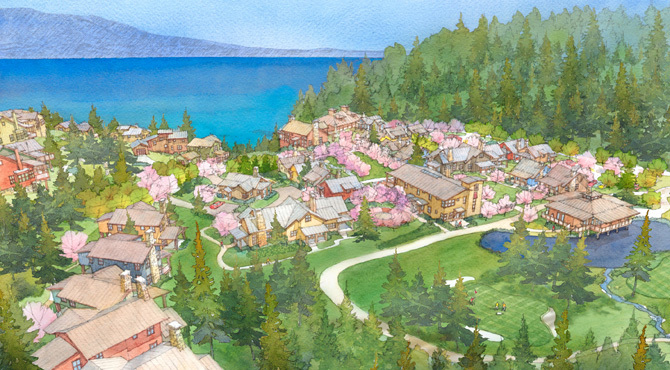 Commercial Guest Accommodation associated with the Inn/Resort in Area C will be restricted to a maximum floor area of 1,500 square metres (16,140 square feet) — which over time, together with the allowed uses in Area A, will provide the necessary scale of operation needed to afford a hospitality facility of that kind on Bowen Island. While still modest as a community hub at Seymour Landing, we believe this is a more realistic and viable approach to the site than has been contemplated to date. In order to thrive, it also needs the vibrancy that comes from a neighborhood community to share in and enable its success. This is the purpose of the recommended changes to Area B and Area C.